The European-developed Principal Anti-Air Missile System (PAAMS) -- at least the France-Italian PAAMS (E) version of it -- finally completed its system qualification on May 14th, missile manufacturer MBDA said yesterday. The final qualification event was a live firing from the trials ship Carabiniere on May 14th on the Centre d’essais de la Méditerranée (CELM) test range, located in the Mediterranean off the south coast of France. 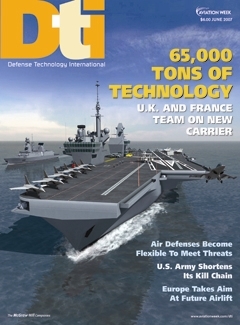 According to MBDA, the test fulfilled all the objectives and, as such, was "confirmed to be a complete success." The trials ship was equipped for the trial with a PAAMS (E) system that uses the Italian-built Empar rotating passive phased-array search and fire control radar. It also comprises a fire control system, DCNS-built Sylver A50 vertical launching system and MBDA-built Aster 30 surface-to-air missiles. Michael Yon posts a video from Baghdad of the not-very-secret but sensitive C-RAM (Counter Rocket, Artillery, Mortar) gun system engaging an incoming round. Yon has apparently taken a few rounds himself for talking about C-RAM, a land-based adaptation of the naval Phalanx anti-missile gun, although open-source documents are available on the US Army and Raytheon's (pdf) sites. For more on its specialized self-destructing round, see GD-OTS (pdf). Keys to the video: first, the sound of the gun (variously compared to ripping linen or the after-effects of a Taco Bell binge) is followed by the image of a line of M940 tracer rounds in the air. Next, the rounds can be seen self-destructing, five seconds and 2300 feet downrange, with the sound reaching the recorder a couple of seconds later. Indirect fire -- milspeak for mortars and rockets -- is one of the biggest killers in Iraq after roadside bombs. Big sprawling bases are particularly vulnerable. I should know. Last fall a mortar blew up my trailer at a British base in Basra, just five minutes after I had left it. 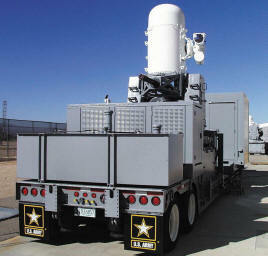 To defend against these threats, last year the U.S. military rushed modified Phalanx naval guns to Iraq: Phalanx, a 20-millimeter radar-guided rotary cannon system designed to kill anti-ship missiles, proved effective at swatting down some incoming rounds. Now a NATO group is trying to improve on that concept. After a couple rough years of wasted money and failed tests, ballistic missile defenses are humming right along. 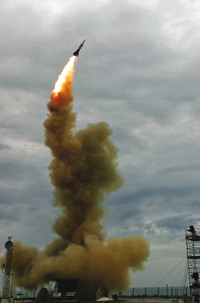 The Navy SM-3, designed for midcourse defense, is hitting its targets in tests and is already deployed aboard warships in the Sea of Japan; the Army's Terminal High-Altitude Air Defense system is hitting its targets too and will deploy beginning in 2009. Meanwhile, the PAC-3 version of the Army's Patriot is being widely fielded for point defense against incoming ballistic missiles. What's missing -- besides rigorous testing for the Ground-based Midcourse Defense interceptors silo-based in Alaska and California -- is a boost-phase weapon that can knock down ballistic missles while they're still climbing into the sky, which is when they're most vulnerable.